Welcome to the Luffa.info blog. Winter 2018-2019 - 2018 was a good season. It was one of the wettest years in history for this area. Fortunately the heavy rains were spaced apart with lots of sunshine in between. There were very few fungal issues and the flowers pollinated well. Propped up the ends of the trellises to help push them apart and keep them standing. They weight was heavy. Most of the fiber was light colored with a few darker ones. Frost held off until the end of October. The size was larger this year as several exceeded 20 inches. One was 22 inches. June 30, 2018 - Another trellis was constructed and the Luffa vines are having a great year on it and the old one. Most are about 10 feet long and it is still June. Many buds, flowers and fruits, some about a foot long already. Only growing a few vines on the fences this year. They are too hard to keep weeded. Black plastic ground cover is the way to go for marginal climates. Warm soil in spring and no weeds. This blog probably won't be updated very often in the future. It's mostly a repetition of the seasonal cycles and there are many things to do. Having a great year so far. October 26, 2017 - There was mild frost last night that did not harm the plants. There will be a hard freeze in a few days. The luffa pods that are ready and nearly ready are being picked and cleaned. September was very dry and they had to be watered several times. The dry hot weather stressed the vines but it also kept them pest free without weeds, bugs or fungus. The number of vines planted this year were few but they produced well due to good weather. The average size is large and the quality is good. Most of the fiber is dense and light in color. Planting surrounded by black plastic and ready made fertilizers reduced the labor. That is important as I have a lot of fatigue from medical treatments. August 28, 2017 - It has been a good growing season with adequate rain. Due to health reasons I was almost unable to grow anything this year but I got well enough to put out less than the usual number of vines. They have been great. Last year was one of the worst seasons ever and this year has been one of the best. Black plastic was used to completely cover the area. A blend of commercial organic fertilizers has been applied twice this year. The rains have been consistent and slightly above average. The sun and wind have kept the vines dried out with few fungal problems. November 15, 2016 - Picking the last ones. It finally frosted after the hottest summer ever. It would have been great if there had been rain. The drought is now an 8 inch rain deficit with forest fires and smoke in the air. Started sorting seeds and germination testing. November 2, 2016 - The dry weather continues. The US drought monitor shows a moderate drought for this area. Rainfall is 6 inches low so far this year. Yields are way down, even worse than last year. Last year was too wet with local flooding and this year has been too dry. The ones I am getting have light colored fiber and look good. Many seeds are not filled out and solid, possibly due to lack of water. No frost yet with record high temperatures through October. September 20, 2016 - Picking early ones. The size and numbers are low but the fiber is dense. Medium sized ones tend to be denser than large ones. I am on track for the hottest year in history. More than 60 days over 90 degrees, normally it's less than 20. The heat would have been good if the rain had been good. It's about 5 inches low so this year. Rainfall issues have been decreasing my yields for the last few years. I have nearly reached the conclusion that irrigation may be the only way to get a consistent crop, even though there are normally 50 plus inches of rain a year. On the plus side the surviving vines continue growing quickly because it is still hot. I am hoping for a late frost this year. July 16, 2016 - The plants had a rough start to the year. Cold weather, drought and severe storms were problems. The vines are finally getting big and starting to produce. April 21, 2016 - Fluctuating temperatures slowed the germinating process but 94% of the Luffa seeds sprouted within 3 weeks. I should be transplanting outside in about 2 weeks. April 9, 2016 - Filled pots with potting soil and put in 3 seeds per pot about 3/4 inch deep. A few seedlings have emerged. Like last year the sunny room I start them in was not warm enough. The weather has been extreme with high wind, snow on the mountains this morning and 27 degrees forecast tonight. Instead of waiting for spring to come back I moved them to a warmer place, a toasty 74 degrees, and they are coming up now. It took a week to get the first sprout. Someone posted on the luffa.info facebook page how they started seeds on a temperature controlled heat mat and how the seeds they got from me sprouted in 3 days. They do germinate fast under ideal conditions. Growers having germination issues often have something happening that is not ideal. Too wet and/or too cold are the usual causes. Here is a photo of the first 4 luffa sprouts along with bell pepper plants. December 17, 2015 - This is most of the 2015 crop. It was a bad year in the southern Appalachians for cucurbits and grapes with the extremely wet early summer. All my cucumbers and pumpkins died from fungal problems. Grapes only produced one third of normal, which is about what the Luffa vines did. There were more brown spots than usual but still managed to produce a number of good ones. The earliest buds and some of the later buds made it to maturity. My soap making customer could use more than I grew this year. If anyone has any extras to sell then email me at contactus@luffa.info for contact info. I may not post anything more until spring so hope everyone has a good winter. September 19, 2015 - September is getting old and the race against frost is on. Approximately 30 to 40 days left. Most of the pods are still hanging on the growing vines. Picked a couple more with good fiber and seeds. September 3, 2015 - Picked the first loofah. It has nice squeezable fiber with no defects. The early ones tend to be good quality but less rigid than the later ones. It's a good start to the long harvest season. August 30, 2015 - This butterfly is enjoying a Luffa flower. July 31, 2015 - The Luffa plants are having a great season, possibly the best ever. Buds, blooms and pods are popping out all over. There are several this size or larger, which is good for July. The temperatures and humidity have been high. The heat is good for growth but the humidity has contributed to fungal bud loss. The good news is that many of the plant nodes are producing two female flowers instead of one. That is something I have not seen before in my plants. Statistics say the local climate is warming and our zip code was recently raised from USDA zone 6b to 7a. The Luffa vines like it. July 28, 2015 - While checking the Luffa vines today found a frog over 6 feet off the ground. It looks like it belongs in a rain forest, not a Tennessee garden. The vines are full of strange new bugs and the frog is stalking them. It may be a juvenile Gray Tree Frog. I was unaware that tree frogs live here. I've not seen bugs and frogs like this before. The garden ecosystem is changing. June 18, 2015 - The Luffa vines are growing fast. Most are approximately 2 meters in length and the first flowers are blooming. The weather has been hot. No rain for a few days so they had to be watered yesterday. Before watering the plants were fertilized with bone meal and liquid organic nitrogen. May 28, 2015 - The Luffa plants are beginning to vine. The unusually hot May has given them good growth. The season started with late germinated seeds followed by an early transplanting outside. Normally they get one light dose of nitrogen while in the pots but not this year. They each got a tablespoon of blood meal for nitrogen when transplanted outside. After more vine growth they will get a more balanced organic feeding with some phosphorous. The plants were put in the ground along with compost and small amounts of wood ash. So far things look great but the rain has been spotty and watering has been needed a few times. Started with 43 plants. The slugs got one but many volunteer plants are sprouting. Something ate the tips off several vines. That sets the plants back in time but they will make new growth. Usually 2 vines branch out at the node before the break. April 28,2015 - Sun for the seedlings today. 100 seeds out of 120 germinated. Where they were started was not warm enough and they just sat there for a couple weeks. Finally stuck a thermometer in the pots and found they were only 66 degrees. A few days out in the sun and things were sprouting. 2 empty pots out of 40 got transplants put in. April 1, 2015 - Spring is here and it's time to start seeds. Planted 40 pots with 3 seeds each, watered, drained, and brought inside. Should have many plants in a week or two. After sprouting they will go outside if it's warm and inside if it's not. In about a month they will be transplanted outside for the summer. March 12, 2015 - The latest video creation has now been uploaded to YouTube. It is a summary of the 2014 Luffa growing season from seedling stage to harvest. I tried to make a reasonably short video but it still turned out to be over 16 minutes long. February 24, 2015 - Winter has been a busy time. After many hours of head scratching the site is now converted to HTML 5. There are a lot of things yet to do with the content but the framework for a better functioning web site is in place. Links are larger and images are more flexible in size. It's an effort to make the pages mobile friendly and better loading. The actual size of the page files are smaller after cleaning out the clunky old HTML. After resisting for a long time, a Facebook page has finally been created. It seems redundant but will reach different groups of people. Photos are posted there along with a few updates. Not yet decided how the social pages and this blog will interact, possibly mirroring the same content. There is video footage of the growing season last year that needs to be edited and put on YouTube. That may be the next cold weather project. The winter started mild and took a severe turn for the worse in February. It has made catching up with the inside work easier as there is little temptation to go outside. Here is a photo of loofahs that were sent to the soap maker in December. Not a big harvest, but good quality fiber. September 22, 2014 - It has been a glorious September with nearly perfect weather. Anyone wanting to visit northeast Tennessee would do well to come in September or October. There has been mostly blue skies and sunshine with puffy white cumulus clouds floating by. Just enough rain has fallen at the right times. The Luffa plants have been blooming and making new pods. They often catch another growing phase in early fall. As the older pods end growth the vines begin to spend energy on new buds. Time is ticking out as the nights have begun to get cool. There should be another month free of frost but no guarantee. The number of new pods that make it to full growth will depend on the frost date. One interesting note this year is that the largest pods grew in partial shade. It seems the shade helped them survive the dry early summer better than the full sun vines. August 21, 2014 - August has been much cooler than normal with sunshine and cool nights. It has been great weather for taking a walk on the latest trail to open. See the many local trails at my hiking site. The traditional hazy hot Smokey Mountain type weather has finally set in. The boundaries between earth and sky blur in a mist of water and plant vapors. Every spot of ground is green with life. The luffa vines are a mixed lot. The vines that received enough water in the dry part of the year did well. The volunteer vines look great. There are several stunted plants that did not get enough water early in the year. They are alive but small with small leaves. The lesson learned is that luffa plants may need watering even if they are alive and growing. They are the most vulnerable when small. A few squash bugs have started to damage leaves. Removing them by hand has been the method of control. It's easy to find them near the damaged leaves. July 8, 2014 - It's been a dry year so far with 6 inches below normal rainfall. With moderate temperatures it has made great summer weather but not enough water for the garden and luffa plants. The vines are alive and growing but they look less full. The leaves appear tough and weathered for this early in the year. They have needed water several times. The flowers started showing up a couple weeks ago and now the first fruits are forming. This photo depicts a new fruit with 2 male flowers. Most vines are in the 5 to 7 foot range and would be longer if there had been more rain. Last year was extremely wet and I got out of the habit of watering. I waited too long to start giving them water this year. Out of all the plants one was nearly eaten by slugs and a few were stunted by the dry conditions. The good news is that most of the buds are green and healthy with no wet weather fungus problems. With any luck and enough water there should be a large number to pick this fall. May 2, 2014 - After 3 weeks the germination reached 92% even with the clumpy potting soil. It took longer than it should but most of the seeds finally sprouted. Only one pot out of 30 was empty but then it sprouted a late plant after I moved one into it from another pot. The plants have been migrating outside during the day and then back in for the nights. The weather was rainy and severe for a few days but now it is clear and dry for a while. The outdoors is beginning to feel more like summer but the nights are still cool. It's time to get the rest of the vegetable garden tilled and ready for the warm weather plants. The onions, radishes, lettuce and other cold weather plants have been growing for a few weeks. It will be a week or more before the luffa plants are transplanted. The forecast will need to be warm before they are put in the ground. Too many times I have planted early only to have a stretch of cold weather slow their growth. Since they were planted late this year there is still space in the pots and no rush to get them transplanted. April 21, 2014 - It's been another crazy spring with late snows. Seed starting time was delayed for a week. The seeds were planted in pots over a week ago and are now sprouting. The pots were kept in the warmest part of the home but a thermometer showed only 64 degrees F for the soil temperature. After setting them out in the sun for a couple days the sprouts really started popping up. About a third of the seeds have germinated. Normally more than that would have germinated by now if the pots had been warmer. The potting soil this year was very wet and clumpy but the seedlings are pushing up through it. The pots with larger plants were filled with soil from last year, drier and more porous. The cold weather garden was planted and doing surprisingly well after being snowed on and frozen. March 26, 2014 - It will soon to be time to start seeds. April is closing in fast. Part of the garden was tilled for cold weather veggie planting and then a late snow storm hit. Three inches of snow was left behind. Most of it melted today. It should be back to 60 tomorrow. Maybe get onions planted outside before starting luffa seeds inside. The site has been in need of updating so it is being rewritten. It should be more mobile friendly. Over a decade of editing with multiple programs has left too much clutter. The new home page is almost done. It won't look a lot different but it will be much better on the "inside". December 12, 2013 - Seeds from this year are for sale on the site now. Winter has set in. All the loofahs have been peeled, cleaned and dried for a month now. The crop total was fairly good considering the best part of the year was wiped out by the extreme rains. There were problems with brown spots and early rotting due to the wetness. Luffa vines need moisture but have fewer diseases and pests in low humidity conditions. The frost arrived October 23 and killed most of the vines except for a few in protected locations that lived another week. The vines planted along a south facing brick wall live longer than the rest. The average size was good and the earliest pods grew large from all the rain. Here's a photo of the loofahs being guarded by Jasper the miniature Schnauzer. They were sold and shipped to a soap maker where they will be added to high quality soaps using the best natural ingredients available. October 12, 2013 - The weather has been perfect with the majority of luffa vines continuing to grow. It has reached down into the 40s at night but no sign of frost yet. Several of the volunteer vines have yielded good sized mature loofahs. The crop is turning out better than I thought it would with pods starting to turn yellow for harvest. Many have been picked already. The number of seeds collected is growing. Started germination testing and should have them for sale soon. Made the first batches of loofah soap. I wondered why loofah soaps cost so much. It turns out the ingredients are not too costly but the amount of labor and time is large. They are for sale on the site now. I've been using one and like it very much. It's scratchy enough to exfoliate with a gentle glycerine soap to clean. Very stimulating for a unique sensual experience. Leaves skin smooth and glowing. September 16, 2013 - Made a video yesterday and posted it on the YouTube channel Luffadotinfo. Pods are ripening and being peeled. The numbers are low due to all the early summer bud loss. Since the rains ended in August the vines are making new buds, flowers, and loofahs. It's getting late in the season as frost could be here in a month. It's hard to say how many good ones will be harvested this year. The ones that have made it so far are good quality, just lacking in quantity. August 25, 2013 - Picked and cleaned the first mature loofah sponge. It's not a large one but the fiber is excellent and flawless. It's stiff with small dense fibers and 13 inches(33 cm) in length. It seems that the medium to small ones often have better fiber than the really large ones. The largest ones tend to spread out the fiber over a larger area. The individual fibers in large ones tend to be coarser too. There are always a small number of pods like this one that arrive early. It is nice to see a good quality one early in the season.The majority of the luffa pods will not be ready until October. The overnight temperatures recently have been at or near record lows which is a concern going forward. With the cold spring start and cool wet summer, an early frost would be bad for the yield. The vines are blooming again after the previous bud losses but time is running short. Hope they get two more months frost free to reach their potential. August 16, 2013 - By the first week of August we had an entire year's worth of rainfall, 41 inches(104 cm). Luffa prefers a dry hot environment and long periods of cool wet weather causes problems. Fungus finally hit causing many buds to be lost. The result is that the first buds that bloomed have produced large fruits due to a lack of competition. The vines continue to produce buds and the rains have tapered off. If the frost stays away long enough there may still be a good harvest. The vines are green and growing with a few insect problems. Weather often poses challenges to any type of agriculture and this year has been tough. The late frost, cooler than normal temperatures, and the extreme amount of rain have all conspired against the luffa vines but they continue to grow. It becomes a race against time to produce more fruits soon enough. Right now it looks like the yield may be low but the size and quality looks very good. Since it is a problem year I'm trying neem oil on a few vines to see how much it helps. It is an organic insecticide and fungicide. Picking bugs off by hand is the normal method of control. The pests are concentrated around curling brown leaves and large enough to see. A few squash bugs and stink bugs have been among the culprits. July 14, 2013 - Mid July. The weather has been unusually wet with moderate temperatures for summer. So far it is about 15 inches above normal rainfall for this time of year. The vines continue to grow at a steady pace with many of them exceeding 10 feet in length. More buds are forming as the luffa vine tendrils latch on to new territory and push forward. The blooms are appearing one or two nodes at a time. Several fruits have formed and are rapidly growing larger. They are at the edible stage but the goal is to grow sponges so they have a long way to go. There is some insect damage to leaves which is worse than usual for this time of year. The bugs don't generally do much damage until late in the season. It's been hit and run as there are few resident pests visible. The vines were fertilized for the first time since transplanting. The blooms were not as numerous and the leaves were getting slightly pale. Fed them general purpose organic fertilizer and bone meal. There have been very few fungus problems which is odd for such wet weather. There have been windy, sunny days. The vines are well spaced and not as leafy as usual. They have not had as much sun and heat as normal possibly causing the foliage and growth rate to be less vigorous. June 26, 2013 - The vines are mostly around 7 feet long and producing more flowers. There were a few very early flowers but now larger blooms in greater numbers are appearing. The rain has been plentiful with abundant sunshine. Since the cold weather of spring has faded conditions have been nearly ideal for growth. The vines continue to grow longer at a fast rate with increasing thickness. The buds are plentiful so there should be a good crop in a few months. Seed sales for the spring have ended. Fresh seeds will be available in the fall. If anyone wants to be notified when seeds are available contact us to be added to the seed notification list. June 8, 2013 - The vines are in the fast growth stage and growing at a furious pace. Here's a photo from yesterday of the first one to top the fence. A few buds are forming and there have been a couple blooms already. This variety seems to not be affected by photoperiodism as it blooms even when the days are getting longer. It can be more dependent on how much fertilizer it gets. They weren't given potash and phosphorous until they were transplanted and they still bloomed slightly early. Not as bad as last year when they were fed at the seedling stage. They did get a couple doses of liquid organic nitrogen which kept them green and growing. The overall health of the vines is good with some unidentified insect damage on a few leaves. The slugs were hard on them when they were first transplanted. The weather was dry for a week but the rains have returned along with tropical storm Andrea. 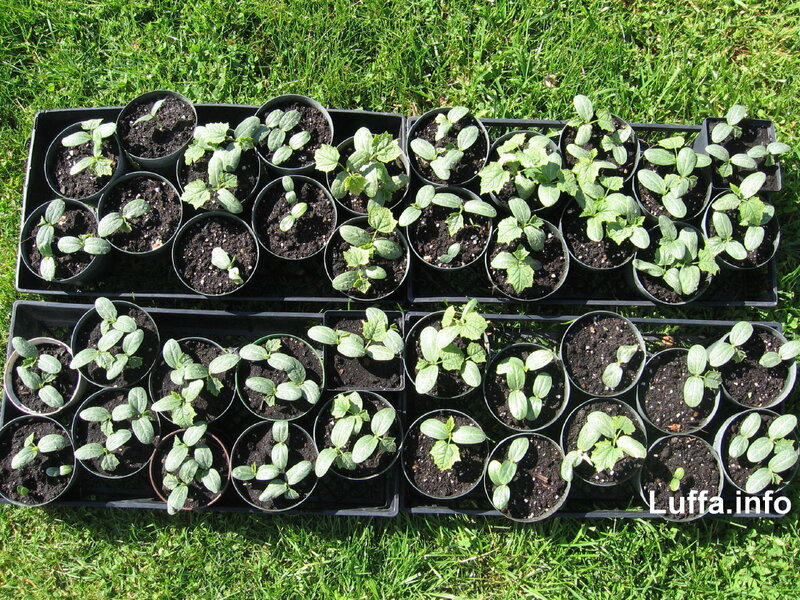 May 11, 2013 - The luffa plants have been transplanted into the ground outside. Holes were dug and compost added. Organic general purpose fertilizer was mixed in with a little bone meal. Organic potting soil was circled around the plants to help them transition roots into our clay based topsoil. It was covered with cypress mulch and watered with a mostly nitrogen liquid organic fertilizer. Most of the seeds germinated so the pots were thinned a week before transplanting by removing the smallest plants. Some of the pots had two extra nice plants. They were divided when transplanted. It had to be done carefully to minimize root tearing. Still a couple unseasonably cool nights ahead to worry about and then it's on to summer. Most of the vegetable garden has been planted so the last week has been very busy. It's time for nature to do more of the work. Here are photos of a pot with three luffa plants before thinning and a week later before transplanting. April 14, 2013 - Warm weather has finally arrived. The spring cool weather vegetable garden has been planted about 2 weeks late. The March weather was worse than usual with below normal temperatures and snow. It's been 8 days since the luffa seeds were planted in pots and they are emerging with 32 sprouts showing out of 90 seeds so far. The next few days should see many more. The germination location was cooler than normal for a few days or they would be further along. A few pots got too much water and are lagging too. The seeds and sprouts don't like mucky soil. With any luck they'll dry out enough to grow. Been setting the pots out in the sun as much as possible. it's still cool at night so they come inside after sunset. One light feeding of nitrogen rich liquid organic fertilizer has been applied to keep them green. With the arrival of new sprouts comes the hope for a successful growing season. February 28, 2013 - The daffodils have been blooming for a few days despite the snow and cold. It's time to start planning the garden and get seeds rounded up. It's nearly time to do pruning of grapes and other perennials. Seeds have been going all over the place. Should be getting some feedback from growers in far flung locales this season. They are going to be planted from coast to coast. A few intrepid Canadians in British Columbia are trying them this year. They have a long enough frost free time and long summer hours of sun but don't know if it will be hot enough. Curious to see how they do. We'll be starting seeds in about a month around April 1st and transplanting in early May. We are now stocking a couple of loofah items from Egypt for sale, compressed whole loofahs and 6 inch sections. Nice quality fiber. They are flat as a pancake and once they get wet expand back into shape. December 21, 2012 - It's the winter solstice. We are now getting the first snow of the season, windy and cold. It's been a good year for a fall garden. Broccoli planted in late August has been excellent with no bugs alive to eat it this late in the year. The old luffa vines have been removed for a couple weeks now. They are torn out in the fall to eliminate the weeds that have invaded. It all gets thrown far away to keep the weed seeds away from the fences and trellises where the luffas are planted. The morning glory vines are the biggest problem. They grow into the luffa vines and leave seed pods all over. There are at least two different species of morning glory here and they latch onto everything. One of the luffa vines this year stayed alive to the end of November before it finally succumbed to the freezing air temperatures. It was growing along a brick wall that faced south. It lasted a couple weeks longer than the rest. Planting along a south facing wall blocks cold north wind and absorbs sun warmth during the day. The mass of the wall and ground can retain heat overnight to help the plants survive a mild frost. Probably a good planting strategy for cooler areas. November 3, 2012 - Our first real hard frost of the fall season happened overnight. The vines are turning brown and black today. The mountain tops were covered with snow by super storm Sandy before Halloween but the valley stayed frost free for a few more days. Still some big green pods hanging on the vines. Most of the loofahs have already been peeled and dried. I'm spending time today pounding the hard green skin off the remaining ones. So far the green ones have had good fiber and size so maybe all the work is worthwhile. It's been a good year overall. We've had enough rain and hot weather to get decent growth from the vines. The size and quality has been good with just a few brown spots on some of the later ones. Sometimes the frost hits in late October so I'm glad it held off until November. Been peeling some of the late ones over the last few weeks. Even some of the late sprouting volunteer vines have grown fiber filled pods, although the skin looks tough as an alligator. The volunteers come up from seeds that go flying away when cleaning the loofahs. Sometimes I sling a few seeds in different directions too. Let nature take it's course. It's amazing how big the volunteer vines get without any fertilizer or the least bit of attention. Should be done peeling and drying in a few days then ship them off to my soap maker customer. There are many seeds for sale now and available in ounce amounts for someone wanting to grow a hundred or two vines.